Today, when it seems like everything has been privatized, when austerity is too often seen as an economic or political problem that can be solved through better policy, and when the idea of moral values has been commandeered by the right, how can we re-imagine the forces used as weapons against community, solidarity, ecology and life itself?In this stirring call to arms, Max Haiven argues that capitalism has colonized how we all imagine and express what is valuable. 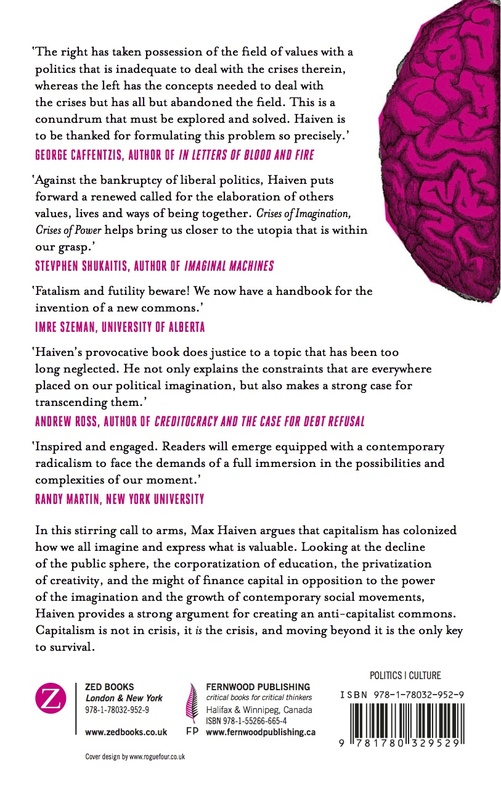 Looking at the decline of the public sphere, the corporatization of education, the privatization of creativity, and the power of finance capital in opposition to the power of the imagination and the growth of contemporary social movements, Haiven provides a powerful argument for creating an anti-capitalist commons. Not only is capitalism crisis itself, but moving beyond it is the only key to survival. Crucial reading for all those questioning the imposition of austerity and hoping for a fairer future beyond it. Stevphen Shukaitis, Lecturer in Work and Organization, University of Essex/Editor at Minor Compositions and Autonomedia, author of Imaginal Machines: Autonomy & Self-Organization in the Revolutions of Everyday Life. Andrew Ross, Professor of Social and Cultural Analysis, New York University, author of Creditocracy and the Case for Debt Refusal. 7. What is the Radical Imagination? Max Haiven is an assistant professor in the Division of Art History and Critical Studies at the Nova Scotia College of Art and Design in Halifax. His work has appeared in journals such as Social Text, Cultural Studies, and Mediations. He is the author of Cultures of Financialization (2014) and (with Alex Khasnabish) of The Radical Imagination (Zed Books, 2014). More information can be found at maxhaiven.com. The struggle against hopelessness is in some ways very personal and in some ways very common. The idea that the global capitalist system as it is today cannot be changed is almost universal. Indeed, this fatalism — at least at the level of individual motivations — is ironically one of the driving forces behind the system’s perpetuation. The vast majority of those whose labors reproduce capitalism (from CEOs and politicians to lawyers and professors; to journalists and software engineers; to store clerks and strip miners) do not do so out of any particular love of the system or economic sadomasochism. Indeed, it is widely recognized that the present order is tremendously destructive, both to the world at large and to our own lives. Rather, like most of us, they participate — to a greater or lesser extent — in making capitalism ‘work’ because they believe there is no other option. How many of us take up positions in the architecture of power based on the rationale that our reluctance or refusal to do so would be meaningless? How many of us have been forced to compromise our values because of the economic pressures of the system? How many of us have justified these compromises in the name of inevitability? Of course, most of us work because of economic coercion; only a few of us are ever privileged enough to entertain the opportunity to say ‘no’. But, even so, we can credit the relatively minimal involvement of populations in social movements less to ignorance and apathy and more to a sense of utter futility. If capitalism and its co-optation of all that we value is inevitable, why bother to resist? Why not simply seek to do the best one can within the system? From this perspective, radical social movements that seek to transform society can only be interpreted as vainglorious or pathologically ideological. It is also this fatalism that enables radicalisms to be co-opted and internalized within the system: if the system cannot actually be overcome, the only horizon of dissent is an inadvertent improvement of the system itself. Radical demands for the re-imagining of value are tamed and made to offer piecemeal solutions to capitalist crises; attempts to live out anti-capitalist values are transmuted into commercialized subcultures; anti-racist or feminist movements are co-opted into opportunities for a select few to enter into the middle class. In Crises of Imagination, Crises of Power (Zed Books, forthcoming), I argue that this sense of futility is the residual effect of the way capitalism ‘encloses’ not only our time, our communities and our environment; but also our imaginations. Enclosure here is a metaphor borrowed from the process by which medieval peasants were dispossessed of their common lands and forced to rely on wage labor for survival. Throughout the book, I argue in various ways that this enclosure of the imagination is something that occurs not simply at the level of the individual mind, but at the level of social and material relationships. Overcoming fatalism, futility and cynicism, then, is not simply a matter of ‘thinking differently’ — although education remains a key part of the transformative process. Instead, the radical imagination and the ability to dream of and build towards different social horizons beyond the fog of capitalist unreason, depends on doing differently; on creating alternatives spaces, times and modes of reproducing ourselves, our communities and our world. This is a process of ‘commoning,’ of building living alternatives not in the sense of future utopias, but in the sense of radical models and zones to reproduce our relationships and our lives based on shared values. In the first chapter of the book, I argue that in order to do this we need to re-imagine the idea of value and pay attention to the way capitalism isn’t just a system for stealing economic value from workers, from the environment and from communities. It is also a system that drives and depends on the transformation of how we imagine social, cultural and moral values (as individuals and as communities). The system’s reproduction, in turn, corrupts and undermines the reproduction of our own lives as we become increasingly overworked, privatized, alienated and enclosed in debt. In this way, capitalism’s inherent and recurrent crises are externalized onto individuals and communities. In order to overcome this vicious cycle, we need to reclaim value. This doesn’t just mean redistributing social wealth in its already materialized form. It also means taking back our collective creative cooperative capacity, no longer lending it to the reproduction of capitalism but instead directing it towards the constant rebuilding of a society based on the values of solidarity, equality, individuality, empowerment and peace. In the second chapter, ‘Publics, Commons, Occupations’, I suggest that to do so we blend a concept of the commons with a concept of the public. In addition to more socialist strategies, which promise a public system based on state-managed social reproduction, and anarchistic strategies, which advocate a radical horizontalism where social reproduction is held in common, I suggest that we need to imagine ways to make the commons public and the public common. In chapters 3 and 4, I seek to show how the capitalist crisis of the imagination played out in two influential spheres. In ‘The Crisis of the Financialized Imagination’, I argue that financialization is a unique means by which capitalism’s economic, political, social and cultural power is synchronized; plunging us into a world of greater inequality, ramped-up neoliberal austerity, precarious labor and ubiquitous debt. I try to show that finance reveals a fundamental dimension and contradiction of capitalism: capital, money and financial assets are all, essentially, figments of our collective imaginations, yet they have terrifyingly real power. This is one way in which capitalism, as well as the struggle against it, relies on the imagination. Financialization, which preys on everyday debt and credit as never before and drives an economy based on otherworldly abstractions of value, transforms our imaginations of who and what is valuable and, in turn, relies on that very transformation. In ‘Within and Beyond the Edu-Factory’, I take the fate of the neoliberal university as a case study: a space where the imagination is disciplined and shaped in the interests of capitalism’s reproduction. In turn, the university’s transformed imagination enables and applauds the neoliberal disciplining of the university itself. The transformation of the university from an elitist ivory tower into an institution primarily tasked with chaining young people to insurmountable debt is not simply about government cuts to higher education in the age of austerity; it is about the constriction of social reproduction and the relentless reproduction of capitalism more broadly. Yet, because of this, the university is also a space of possibility, experimentation and resistance. While its overarching paradigm is one of the enclosure of knowledge and the foreclosure of the future, it can also be a laboratory or nursery for the radical imagination and for experiments in reproducing life otherwise. It is with this idea in mind that chapter 5 focuses on ‘The Enclosure of History, the Debt of the Past, the Commons of Memory.’ Here, I expand on some of the more conceptual and theoretical themes in Crises of Imagination, Crises of Power; notably the tension between our collective, cooperative, creative powers and the way they solidify into durable commodities, things, institutions and social conventions. For me, this is the most important question of the politics of the imagination: the way it forms into patterns and processes which, in turn, shape the flows of the imagination; and the way this process can lead both to the rigidities of hierarchy, exploitation and oppression and to the radical possibility of change and revolution. In chapter 1, this theme arises in terms of the way values are transformed into economic ‘value’; the way the processes of social cooperation are conscripted into the reproduction of oppression and exploitation. In chapter 2, the theme emerges in the tension between the idea of a horizontal, democratic ‘commons’ and the need for more durable, structured ‘public’ institutions. In chapter 3, I explore this in terms of the power of largely ‘imaginary wealth’ and the way financialization’s economic and political power relies on and helps to feed its social and cultural authority. In chapter 4, I explore the way the university — as an idea and as an institution — is a material site of struggle over what is imaginable and over the politics of the imagination writ large. In chapter 5, I turn to memory and its importance. Not only does memory reveal the past; it is also an intimate and important part of the way we reproduce our lives and our society in the present, and the way we, together, forge our futures. Rekindling the hopes, dreams and passions of past generations of radical struggle is critical both because it can lead to better strategies for change now, and because it answers to the ‘debt of history’: the way that past events haunt the present and the way the hoped-for utopias of past revolts animate our dreams today. I explore how mainstream history erases these radical legacies or conscripts them into the service of rationalizing today’s status quo as inevitable, contributing to the sense of universal fatalism and futility that reproduces capitalism in the imagination and in material reality. I also try to suggest that the ‘commoning’ of memory is not about creating a different authoritative version of history, nor about abandoning all hope for historical accuracy. Instead, it is about creating intentional spaces and times to bring memories together as a way to reproduce our lives, our relationships and our social order based on common values; to bring the past to bear on the present in order to create different futures. At issue here is the politics of the imagination and the power of creativity, not as we are accustomed to imagining them, as personal possessions, but as shared or common capacities. In chapter 6, I try to show that the very idea of creativity itself has been enclosed, made to serve the reproduction of capital and to conscript the imagination to the services of privatization, profit, consumerist individualism and gentrification. Today, we’ve seen the promise of creativity used as a carrot to entice us to invest our hopes, skills, passions and energies in a capitalist system that does not reflect our values or meet our needs, and which in fact undermines creativity in any meaningful sense. I conclude by re-imagining creativity in a way that doesn’t valorize individual genius but, instead, makes us aware of how all creativity — even when it is expressed in individual pursuits — is both the product and the producer of our shared lives; a fragment of our collective, cooperative, and common labors. Likewise, in chapter 7, I approach the question of the radical imagination. Tracing the idea and the ideal of the imagination from ancient times through European colonial modernity and into the present, I suggest that the value of the radical imagination is not simply its capacity to make us think differently; but the way it feeds and is fed by forms of cooperation. As with the process of ‘commoning’ memory, I want to frame the radical imagination not as a thing some people possess, but as something we do together. The radical imagination emerges from our experience of non-capitalist values in the fabric of our lives, and in turn can inspire and shape the struggle to render those values common and militant. The politics of the imagination are paramount today; but these politics are not simply about dreaming up future utopias or developing sophisticated critiques of the status quo. We need to develop a dialectics of the imagination. In Crises of Imagination, Crises of Power, I aim to show how, in a very specific way — and in the context of today’s struggles within, against and beyond austerity — the imagination is a process of collective doing. More generally, I also aim to demonstrate how the imagination creates reality and how reality in turn shapes the imagination. I want to make plain that, because of this dialectic relationship, the crisis of capitalism (or, really, capitalism’s multiple, overlapping crises) is also a suite of crises on the level of the imagination itself. And I set out to illustrate the fact that overcoming both sets of crises (those of capital and those of the imagination) demands the intertwined work of rekindling common values; imagining social relations and the future otherwise; and, in a militant and radical way, building powerful alternatives and social movements. The fatalism and sense of futility that pervade the imagination today and that facilitate the reproduction of capitalism are, existentially, something of a defense mechanism. I believe that on some level, most people know that the capitalist game is rigged, that it is destroying the planet, that it is making us miserable (or soon will), and that it must be stopped. The cynicism, obtuse skepticism, blithe ignorance and individualistic sensibilities that might be bemoaned by activists and militants today are, in actuality, the allergic reaction of a sort of psychic immune system. To the extent that we can ignore or turn away from the systemic implications and ramifications of capitalism (and our own participation in it); to the extent that we can insulate our imaginations from the severity of its crises; we can imagine that our own individual lives (and perhaps those of our loved ones) can be meaningful, fulfilling, painless and happy. To the extent that we recognize and acknowledge the everyday and global-scale tragedy of capital, we must, if we are decent people, dedicate ourselves to a lifelong struggle. Let me hasten here to note that I am not suggesting that capitalism is merely a state of mind. Nor am I arguing that overcoming capitalism is simply a matter of withdrawing our imagination. Capitalism is a material system of wealth and power that perpetuates itself through its co-optation of our labor. But it is also a system driven by a ruling class that controls the major societal tools and infrastructure, and that uses its wealth and power to control governments. Overcoming capitalism will, inevitably, require the reclamation of collective wealth from the ruling class, and that requires material struggles, mass movements and, probably, some level of violence. More accurately, the endemic violence of class struggle — which today is experienced by the working classes largely as the misery of poverty, overwork, debt, imperialism, racism and patriarchy — needs to be redirected towards the authors and beneficiaries of the system. In my desire to explore the tensions between value and values, I am not seeking to make a moralistic argument against capitalism — such arguments are far from necessary. Rather, I am trying to gesture towards a historic circumstance of struggle today. I seek to show that in contrast to the dynamics of class struggle and capitalist accumulation of a century ago, the system is more invested than ever in preoccupying and enclosing our sense of self and of the future; our hopes, dreams and aspirations; and our capacity to imagine. As such, the possibilities of meaningful solidarity and class struggle depend on the politics of the imagination. The imagination is a material process: it emerges from and informs our capacity to cooperate and labor together, and as such is at the core of the reproduction of value. If we can understand capitalism as a system based on the reproduction of value, the role of the imagination cannot be gainsaid. As capitalist crises deepen under today’s new regimes of austerity, the desire to reinforce our ignorance, apathy and fatalism becomes stronger. As the contradictions of the system grow ever more pronounced, they put greater and greater strain on the veneer of capitalist ideology. And yet we should never expect that this strain will lead to the emergence of the radical imagination. Indeed, without the hard work of organized and purposeful anti-capitalist agitators, it will more likely see the rise of what we might call the reactionary imagination: the forms of religious fundamentalism, ethnic nationalism, backlash racism and right-wing vindictiveness that, today, mount on the horizon of politics around the world. As I explore in chapter 1, these movements — animated by a pathological attachment to idealized, punitive and excessive ‘values’ (i.e. family values, Christian values, Western values) — conscript the imagination much more easily and readily than the more complicated but more radical ideas I have tried to summarize in the book; and which can be found in the politics of anti-racism, socialism, feminism, queer liberation movements, ecological justice struggles and anti-capitalist politics. The years to come will be defined by struggles over the imagination. But these struggles will, themselves, be defined by the ability of various groups and factions to make radical values a reality. A revolution is not made of good ideas, but rather by good ideas materialized in social spaces. Solidarity is not a matter of having the right political ideals and sympathies, but of building real, tangible relationships. This is not to discount the importance of theory and reflection (otherwise, why would I have bothered to write such a book? ); but it is to say that the struggles to come — like the struggles throughout history — will succeed to the extent that they preoccupy themselves with the dialectic of imagination; and the way the imagination as a shared capacity grows out of social cooperation, alternative building and the establishment of new commons. And, likewise, it is only in the soil of these cooperative ventures, these lived alternatives, and these new commons that the imagination can find root and withstand the vicious storms to come.